One of the many things we love about Broken Hill is its thriving art scene! The beauty of the rugged Outback and our unique Heritage City has inspired artists for over a century, and followers of the Broken Hill Art Trail will find this beauty interpreted in so many different ways – from street art and painted vehicles, to stunning landscape paintings. Our neighbouring towns also boast incredibly talented artists, with many artist studios and galleries. Since this gallery opened its doors in 1904 – over a century ago! – it has been a focal point for the artistic scene in Broken Hill and beyond. The Heritage City has seen a lot of change since its gold-mining heydays, and the art displayed here isn’t just breathtakingly beautiful, it’s also a slice of Australian history with artworks ranging from over a century old to cutting-edge contemporary, and with indigenous artworks both ancient and modern, this gallery demonstrates how the world of art has changed both in Broken Hill and beyond. You can also pick up some great finds for art-lovers young and old in the excellent art gallery here! A little bit of context that’s vital for art lovers visiting Broken Hill to be aware of: the Brushmen of the Bush, a five-artist painting group who painted together from ’73 to ‘89, are synonymous with our local art scene. The works of these five artists – Jack Absalom, John Pickup, Eric Minchin, Hugh Schultz and Pro Hart – is beloved in Australia and beyond. Each of these artists is incredible in their own right, and art lovers visiting Broken Hill should doubtlessly familiarise themselves with the works of all of the Brushmen – but as a starting point, we’d recommend to pique your interest with Pro Hart, an artist who captured the spirit of the Outback across many forms, from ochre-red landscapes to brightly coloured flowers and insects on canvas to gorgeously decorated cars, fridges and even letterboxes. Just over two hours out of Broken Hill, Wilcannia is a well-known Aboriginal art hub, and Eddy Harris is an internationally renowned artist from this area. His works beautifully display the land and its flora and fauna in a way that highlights his love of country, and as an accredited national parks adviser and cultural interpreter of the area, his gallery is an excellent place to learn about Aboriginal art – he offers guided tours of the property to show off the local flora and fauna, bush foods, medicine and more. Inside the Living Desert Reserve (9km from Broken Hill) you’ll find twelve huge sandstone artworks, completed in 1993 by artists from all over the world who visited Broken Hill for a sculpture symposium. These amazing sculptures are particularly breathtaking at sunset, and make for a gorgeous photo opportunity! Home of the world’s largest acrylic painting on canvas (aptly named The Big Picture), Silver City Mint & Art Centre is a very popular tourist attraction, and rightly so! With the enormous size of the 100m painting, it really does feel like walking right into a painting. You’ll also find a gorgeous range of metal sculptures here – many of which are for sale, and make an excellent Australiana souvenir – as well as the stunning artworks of popular local artists Greg Kennedy, Peter Anderson and Rob Wellington. 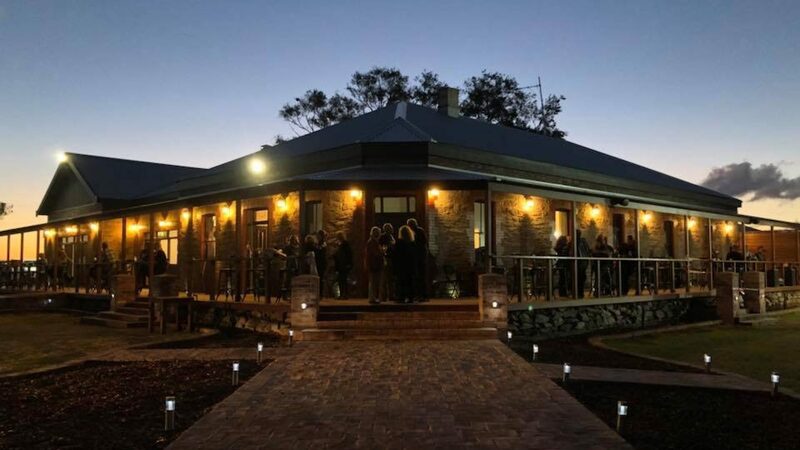 A visit to neighbouring Wilcannia wouldn’t be complete without enjoying the atmosphere and the extraordinary backstory of the Queens Head Hotel. Opened in 2017, the 140-year old building is a pub-turned-gallery, which owner Andrew Stacey envisions as providing an inspiration for Indigenous youth and a meeting place for the community – from a “public house of drinking… to a public house of healing”. The artworks you’ll find here are from established and new artists alike, and from young to old, and the facility itself reflects the important role that art plays in bringing community members together, and the role that the process of art-making plays in sharing stories and enhancing wellbeing. Located in Silverton, John’s gallery is a celebration of all things Outback – from his iconic emus to dunnies, wildflowers to Ned Kelly and much more. His artworks are a lot of fun, as is the gallery itself – with its cheeky “if this is out, we’re open” sign out the front, and located in a true-blue Aussie tin shack, it’s truly full of John’s unique personality and a far cry from the stuffiness that can sometimes be associated with the world of galleries. Well worth a visit! This exciting museum lets visitors experience the underground without actually going under, with its realistic walk-in mine and detailed mining models bringing Broken Hill’s mining history to life. It also boats an exciting range of artworks created from the mining materials, offering a unique new interpretation of Broken Hill (also known as the Silver City). Howard Steer is a sought-after artist with a satirical style, whose bold colours perfectly capture Outback life. With artwork titles such as “Adventure Before Dementia” and “Call The Flying Doctor The Yabbies Are Biting”, he practices what he calls “story art” – pieces of art whose details tell the story of a moment. Another of the beloved Brushmen of the Bush, Jack Absolom’s gallery is located in a quaint period home, and as well as providing a gorgeous collection demonstrating the dramatic, unique beauty of the Outback through his landscape prints, you’ll also find a Western Australian Jarrah opal display case full of opals, which would be well worth checking out in its own right – absolutely stunning! With so many beautiful artworks celebrating the area’s heritage and natural beauty, you’re sure to find plenty of creative inspiration when you visit Broken Hill.